I didn’t have a time slot big enough during the day to fit in a longer grocery shopping trip this week, so I settled for a couple of quick grocery stops. Above is my quick stop into Dillons and the health food store. I was especially excited to find tilapia marked down — yum! 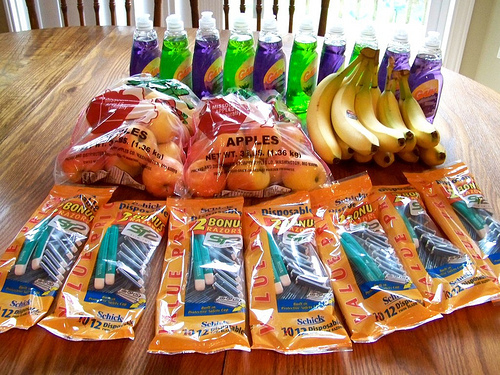 And later on in the week, I stopped in Walmart to pick up free razors, free dish soap and $0.18 per pound bananas and I also stopped by the health food store (again!) to pick up apples. Near the end of the week, we were almost out of milk, so my husband picked up a gallon of milk and chocolate (not pictured). I also bought three dozen farm-fresh eggs from my brother (not pictured). 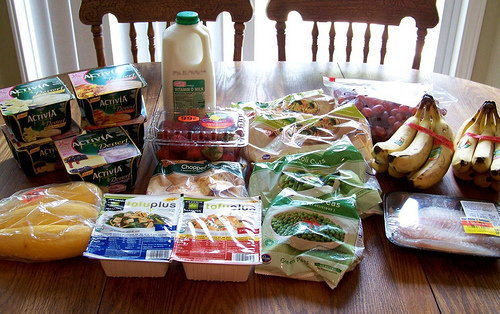 Altogether, we spent just under $40 on groceries this week. And while these pictures have nothing to do with saving money, since I was posting pictures of my groceries, I thought I’d share a handful of other pictures on my camera. These just melt my heart! Silas is 16 months old and still doesn’t have anywhere near the vocabulary the girls did at this age (though he has long ago perfected the art of communicating by grunting and vowel sounds!) Can you tell he’s rather mischievous and did I mention busy? However, I’m very thrilled that he’s finally starting to enjoy being read to, rocked and sung to. And I’m soaking every bit of his snuggles up because he’s growing up so quickly. Sisters who are fast becoming best friends — well, most of the time that is! It’s so much fun for Kathrynne to finally have a sibling old enough to play along with the creative ideas that she’s constantly coming up with. In a day’s time, the girls might be everything from soccer players who are in a fierce competition, to nurses delivering babies, to entrepreneurs setting up their own card shop. You just never know what they’ll come up with next! Kathrynne has recently traded her long-held desires for getting a dog to instead save up for a horse. We’ve tried to explain to her that horses are very expensive and we’ll need to move to a place with a bigger yard, but she’s not a bit dissuaded and often talks about, “When I get my horse…” like it’s a done deal. We’ll see! 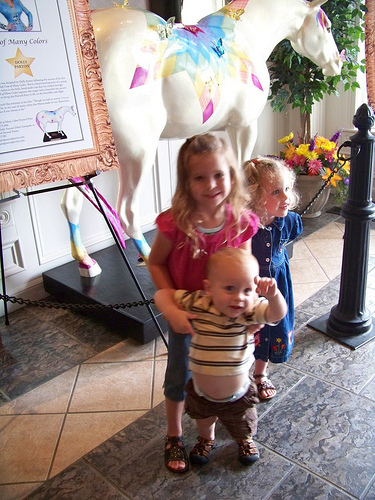 Ever wonder why you don’t see many pictures of all three children together? Well, it might be because getting them all to stand still long enough to snap the picture is quite a feat indeed. 🙂 The good news is they ensure that no day is ever dull at our house nor do we ever run out of things to do! We love ’em to pieces and thank the Lord constantly for giving us these three children to train and raise and nurture. Your kids are adorable!, and I can totally relate to taking a picture with 3 kids. I have 3 boys, and there is just under 3 years between them all, so one year when we were choosing the photo for the St Patrick’s day card(it was so far after Christmas, and those cards never made it in the mail, that we made one for St. patrick’s Day instead), we decided to use the ONE picture of the three of them that actually turned out decent, but just to keep things “real” we also added a Picture where the three year old is smiling, while holding the screaming 3 month old, and the 18month old is screaming and pulling on Daddy’s arm. Everyone who received one got an extra chuckle out of it, and they always ask when the “Thomas family Reality photos” will be in the mail next. I love these pictures… how precious! Your girls look like they are close in age to mine… what a sweet age. I love how they are starting to become true friends, it’s just makes my momma heart SO happy, sounds like you are experiencing the same. Except my older girl is the fearless one and my younger is a “Momma, hold me” (all the time) type of girl! This is perfect timing after a tough night with my girls… all evening we had fighting, screaming, the works. Thank you for reminding me how blessed we are to have them, even on the hard days! I am amused that Kathrynne’s desire is for a horse. As your daughter, I am sure she will have worked out a way to save for one in cash by the time she is 8 1/2 (9 at the latest)! Such beautiful children, they look so sweet and happy. Between you and my daughter inspired me to go to Walmart -not a place I normally shop-but you can’t pass up those good deals! Yes, sounds like Kathrynn has her own BHAG! (I had to look that up when I saw it in your other post). Sweet children!! My family loves receiving our Christmas cards, which include an attempt of getting all 3 of my boys (ages 7, 5, 3) in a nice, brotherly photo. The recipients get a giggle out of it, and thank me for NOT sending a nice, posed picture, but one that shows their personalities. Enjoy your cuties, and be thankful for the pictures showing their enjoyment of childhood and fun relationships with each other! What beautiful children! My husband and I joke that we no longer show up on film as we have photos of the kids but none of each other. About once a year we find a third party to snap a picture of all of five of us together and hope we can use it for a Christmas card. Love your kids pictures. They are so precious. 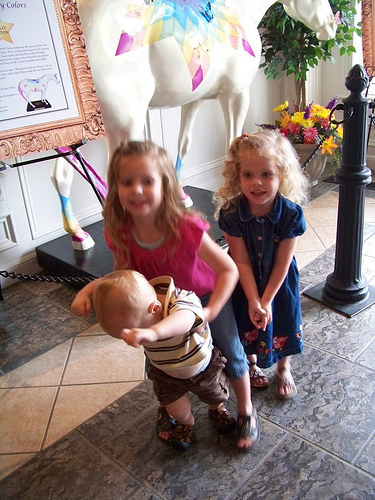 It’s true, getting a perfect picture is something happens rearely with my kids as well. It doesn’t matter, and my computer get loaded with pictures as I couldn’t make my mind to delete any of them (even the shaky ones) . Love the pictures, thanks for taking the time to share them. Thanks for sharing the photos of your precious children. I know you’re probably tired of hearing it, but from a mom of a teen, continue to keep that sunny attitude of yours – the time flies too quickly! They are absolutely adorable. Enjoy! Yes, I agree! I have 3 teens, (the oldest is away at college for year 2) but I miss my girls being young. Seeing photos of Crystals little ones, brings back such sweet memories for me. Thank You, for all you do Crystal! I love the photos of your kids, they are so adorable, and you can tell from the photos that they are keeping you busy. I used t o be able to take so many great photos of my two oldest son together, but now that the little one has arrived with full force….it is just not possible to get three in one photo…at least not sitting still. You did great on your savings despite a busy week. Since we only have one car, I can only do one shopping trip each week, and this one was particularly hectic. Come share your weekly savings at the , and connect with other frugalistas. . The Top Frugalista of the week will win a free ad space! Thank for sharing pictures of your children – they are just adorable. We also have two girls and a boy, in the same order and about the same age as yours. They definitely keep us on our feet (and on our knees), and laughing daily! Thank you for sharing pictures of your family. Our children (we too have 2 girls and 1 boy) are very close in age to your 3 and it’s fun to read about your and compare (well not really compare, but you know what I mean) to our 3. Our son just turned 18 months is just starting to enjoy being read to and looking at books as well. I love to see that! It cracks me up, his language is slower to come as well. His first word was “truck”. Ha! Such a boy! I feel you on the picture thing! I have yet to get a decent picture of my three children together. MAybe it has something to do with their age? 13 year old boy~too cool to have his picture taken. Thanks for sharing your fam! I always smiled and nodded when people said “they grow up so fast!” but last night found myself crying to my husband about how quick our baby girl is growing. He laughed at me, since she IS only 3 months 🙂 They’re too precious! 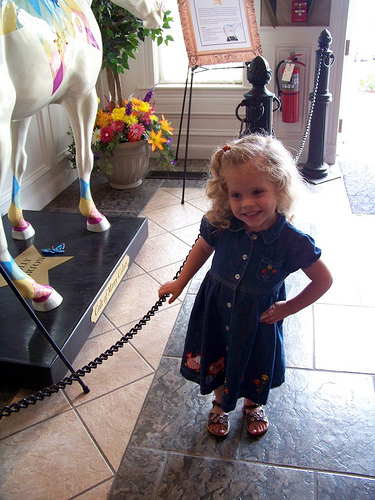 My 5 yr old daughter has long wanted a horse (so has her Mama…I had one growing up)! A while back, she said we needed to get a horse. When I told her we didn’t have any place for a horse to live and what would feed him? Her answer? “We just need to move to a farm with a barn!” As if it’s as simple as that!! 🙂 What a joy these little ones are. Thanks for sharing a glimpse of your life! I loved the bonus pictures today. So cute! I forgot to mention I got free Ovaltine this week at Safeway by loading the two ecoupons and using a paper coupon. Have a great week. My almost two year old is the same way! I have two older girls that had a huge vocabulary at this age. Him….not so much. He does however like to grunt and point at everything. I think he may have invented his own language! @mari, I have done that before, just gone in to use up my “Free” coupons before they expire. Around here, we do have sales tax on groceries and non-food stuff, so we still pay the tax. But depending on the cashier, if they don’t adjust the $1 coupon down on a .97 item, it gives me a bit of overage towards the tax! Beautiful, beautiful children. You are truly blessed for them and for a wonderful marriage. I remember going to church and talking with the older folks~if they mentioned their homes were too quiet/boring–I would always tell them we don’t know the meaning of the word and that if they wanted a little visit from us–we could share some excitement with a visit in the form of three little blessings! They grow up so fast~now my “little ones” are 15, 13, 11. My oldest is now 26 and it seems like yesterday he was toddling around. Treasure the years you have now because they sure fly by fast! Aww love the pictures! & just a hunch that ya’ll went to Dixie stampeed while down in Branson? I used to work there so the carriage room gave it away with your son! Hope you had fun! “When I get my horse…” LOL! Your children are adorable. Silas is getting so big and looks so much like you! The pictures are cute. Since yo said he doesn’t have a vocabulary yet you may wish to try this advice, it worked wonders for my son’s ability to read and speak better. Turn on the closed captioning on your television set and leave it on ALL THE TIME, with the sound on too. Children get to hear the sounds and see the words . They learn synonyms for some longer words that arent captioned and are replaced by shorter words. I tell this idea to all parents as it is a free valuable learning addition for any child. My son started watching things and reading because occasionally the captions run ahead and he wanted to know what came next sooner. Your middle daughter looks just like you- cute! Silas is getting so big – seems like it was just yesterday with Kathryn though…time flies! Your pictures are so cute!!! 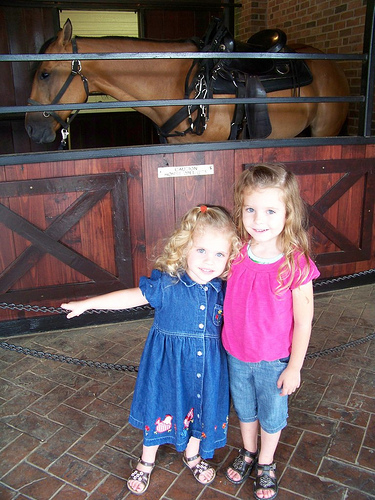 We just went to the Dixie Stampede this past summer. Your kids are so adorable! I was horse-crazy from a very early age – my mom swore that my first full sentence was, “I want a horse!” I got one for my 8th birthday – best present ever! Now it’s my 8-year-old daughter who is horse-crazy and we are planning and budgeting to buy two horses in the next few years. You can actually get a horse for pretty cheap these days, since so many people are looking to get rid of them due to the bad economy. It’s the upkeep that is soooo expensive! As a mom to 3 boys i can say that all of them are full of mischief in their own way. My youngest is only 7 months and I can’t get all 3 of them to hold still…..hoping to get them all together when they are maybe teenagers! Thank you for sharing such lovely pictures. I have noticed the same thing about our only boy — he is 14 months and is only saying a few (quite garbled) words, wherease his oldest sister at this age was heading toward her 100th word! I guess boys really are just different. 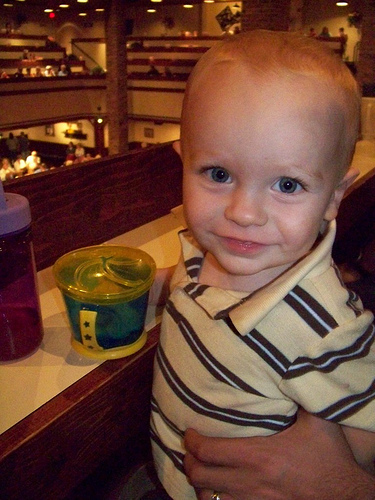 I totally understand praying for the safety of a “fearless” child….our 2 year old is our “heart attack a day” kid. We are convinced he could be asleep in a padded room and find a way to get hurt! So much energy….so much curiosity….and so much fun. What a blessing life is! your children are so precious! My son needed a family picture for nursery school so after many attempts to get him (age 3) and his sister (age 1) to look at the camera at the same time my husband and I finally turned on the TV and put the camera in front of it. I’m not saying it was a perfect picture but we were all looking in the same direction. We don’t have professional pictures taken that often because of the price and mostly because I really like the look of home pictures- they don’t look posed and show the hecticness (I know that is not a real word) of family life. When I look back many years from now the spir of the moment pictures are what will bring a smile to my face. I have two boys. My oldest was saying sentences when he was 9 months old. My youngest didn’t say a word til the was 3 years old! Now you can’t shut him up. He is now 9 years old and gets straight A’s in school. I have a 4 year old (extremely hyperactive) and a 4 month old (teething already!) so I’m anxious to see how holiday photos will turn out this year…we haven’t tried it before! Where did you find that denim jumper? I am having such a hard time finding time to sew right now so I am trying to find good clothes for my daughter but the thrift stores are very scarce right now. The jumper is a hand-me-down from friends so I’m sorry I can’t be much help there! I LOVE seeing pictures of your kids! Keep ’em coming 🙂 You’re such a good Mom! While I’ll agree your kids are most certainly adorable, I admit I was intrigued by something in the foreground of your grocery photo. В интеренете нашел важный web-сайт про направление дапоксетин киев. У нашей организации авторитетный веб портал со статьями про цена на жмых.